President Trump wants to cut taxes for billionaires, and help fossil fuel companies make climate change worse. In the Valley on November 8 and November 10, hundreds of people attended rallies calling on politicians to fight Trump's agenda. Raising taxes on billionaires would make it possible for the government to cut taxes for everyone else, improve Amtrak, and help poor people in Africa, among other possibilities. Around 300 people attended the rally in Amherst, which was organized by Patricia Fiero. “It went well,” she told the Valley Post in a telephone interview. The organizers of the rallies have a web site at www.MoveOn.org. It says, "We envision a world marked by equality, sustainability, justice, and love." The below photo from her rally was provided by Freed. To enlarge the photo, click on it, then scroll down and click "see full size image." More than 100 people were at the Northampton rally. About 70 people attended the rally in Putney, Vermont, near Brattleboro. There were rallies in Brattleboro and Greenfield. More than 50 people attended the Keene rally. In other Keene news, on November 10, the teachers' union held a rally at Central Square. More than 100 people were there. The goal was to win a fair union contract. The teachers have a web site at www.nea.org. 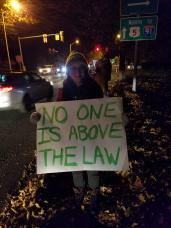 Nov 8th Rallies - "No One Is Above the Law"
Submitted by Anonymous on Fri, 11/16/2018 - 12:27. Regarding the headline of this article, our rallies in Longmeadow and Springfield on Nov 8th were "No One is Above the Law" actions. As Steve mentions above, they were part of the nationwide rapid response network that Moveon.org organized to activate if and when President Trump attempts to impede the rule of law. When Trump appointed Matthew Whitaker as AG on Wednesday, Nov 7th, MoveOn activated the network, and within 24 hours, we hit the streets. Looking forward ... while I hope Trump doesn't do anything else to impede justice, if he does, we'll be ready. To sign-up for the next rapid response team action near you, go to moveon.org. We'd love to have you join us! Submitted by Anonymous on Wed, 11/14/2018 - 17:06. Submitted by Anonymous on Wed, 11/14/2018 - 11:40.